Octopus Syng was formed in the summer of 1999 by the bands guitarist and vocalist Jaire Pätäri. Jaire recorded two albums under the Octopus Syng moniker before forming a four-piece band with Joni (guitar and backing vocals), Antti (bass) and Jukka (drums). This line up recorded Reverberating Garden No. 7 in 2014 and Hollow Ghost in 2016. 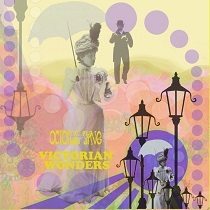 Victorian Wonders takes many of the themes, sounds and textures that made their previous albums so alluring and gives them a subtle twist. A rich, dark and sometimes mystical brew of modern psychedelic sounds, Victorian Wonders is a sensitive and melancholic record that, like its predecessors, draws on the spirits of Syd Barrett and early Floyd for inspiration. It is, in parts, dissonant and eerie, and in others whimsical and diaphanous. Its a luscious experience, a trippin' musical creature, where each note is a short journey to unimaginable places in our minds. So, relax and let yourself drift into an ethereal world of dark imaginings and prepare for a very strange trip! All songs are dressed/painted with their characteristic peculiar North European dark and cold but vivid folk psych style! The whole album acts like a long Sunday walk, an autumn morning, to the citys green park. This is exactly the picture you get after listening to the first song of the album, the trippy folkish One Day At The Amusement Park. If You Were A Flower is a sweet n sunny flower-pop-folk tune while the acidly-drenched 19th Century Romanticism makes me wonder what would have happened if my mind could work in reverse, with a medieval mysterious kind of impact becoming psychedelically strange! Otto Rank Is A Traitor with its whispering narrative style is a modern acid folk tune while the scenery becomes dreamy and nostalgic with Go Away Damn Raindrops under a rather weird melodic pattern. Sundays Jackdaws starts under bands familiar folkie vein but it slowly transmits lots of acid melodic psychedelic vibes. It seems that we reached the sunniest part of the park with Roundabout without losing that strange kind of musical feeling! Spider Webs is a bit dark melancholic acoustic song while Early Song is an acid surreal folkie tune with weird instrumentation. Album closes with These Precious Summer Nights, a dreamy relaxing reminiscent song with female vocals. One thing is for sure, youll find Syds spirit wandering here and there all over the album! So, for those who believe, the ceremony is about to begin! Recommended!  TimeMachine.com EXCELLENT! !